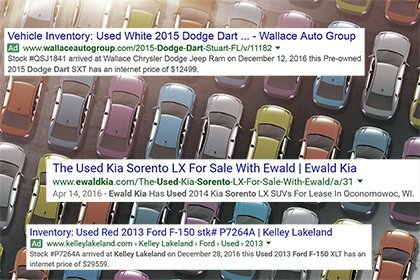 CarCaster™ by Chroma Cars allows for effective Inventory Based text ads to be generated for the Google Ad Network. With proven templates let our system update, launch and deactivate inventory based text ads for you on the hour. All Ads are routed back to the VDP's on your existing website, or if needed we can generate Individual landing pages for each vehicle in inventory. Once Configured the daily feed updates will do all the work needed to keep your Inventory Ad Campaigns updated. 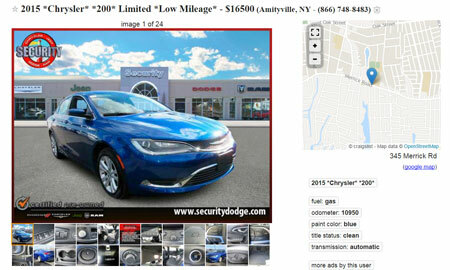 CarCaster™ by Chroma Cars allows for effective Inventory Based Display ads to be generated for the Google Ad Network. With the ability to generate any popular ad sizes, then launch and manage inventory based on for sale status on the hour. All Ads are routed back to the VDP's on your existing website, or if needed we can generate Individual landing pages for each vehicle in inventory. Once Configured the daily feed updates will do all the work needed to keep your Inventory Ad Campaigns updated.